South African Flag Visible From Space. An economic driver and sustainable symbol of hope. FCB South Africa is running an idea up the flagpole. A really big idea to bring a sense of hope and change to South Africans alike. 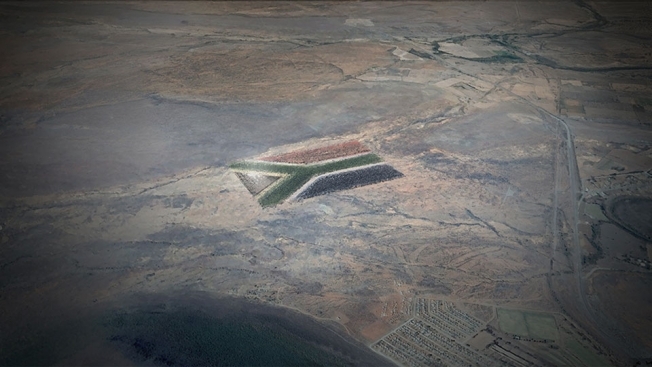 It’s main component is the South african flag so large, it will be visible from Space! The Giant Flag project was put in motion by Guy Lieberman, the agency’s head of green and social new business development. This concept has been designed to foster national pride, improve the lives of people in need and make a lasting impact on South Africa’s economy and environment. So exactly HOW big is this flag project? The proposed flag will measure 66 hectares, which is almost the size of 66 soccer fields. It’s red, green, blue and gold sections will consist of millions of cacti and succulent plants that can thrive in the semi-arid Karoo region. Solar panels designed to power the equivalent of 4000 homes will make up the flag’s triangular black patch. (They will also “harvest” rainwater to feed the flag’s living components). 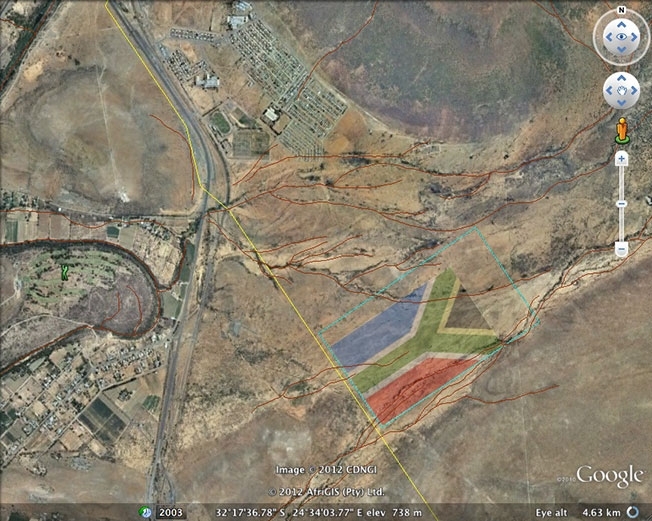 The white areas of the flag will be access roads. Not only will the project be a massive one, but it will also provide more than 700 jobs in Camdeboo Municipality, where the unemployment runs over 40 percent, and support tourism, hospitality and various enterprises over the long haul. Lieberman says, this project will serve as a symbol of hope, cooperation and sustainable growth for South Africa and beyond. But..where did the whole giant-flag idea sprout from? Lieberman drew his inspiration from the 2010 FIFA World Cup in South Africa, feeling it had an emotional impact the citizens of the country. After the World Cup, FCB launched the much -praised “Keep Flying” campaign to encourage the nation to maintain its momentum. Eager to find another project that would simply keep the campaign going the Giant Flag idea was born. Of course, a 66-hectare flag can’t be built on the cheap. What’s the price tag, and who’s footing the bill?